What would you say if I told you my new favorite shampoo costs over $100? Yes, you read that right. There's honestly nothing I've brought into my shower recently that makes me happier than Philip B. Russian Amber Imperial Shampoo. The tantalizing scent channels the opulence of the Romanov dynasty, when the healing and calming properties of Amber Oil were treasured by a privileged few. Now, you'd hope that if a product is called The Fountain of Youth for hair, it would deliver. And in the case of this big tub of lush, thick shampoo, it most definitely does. It's rich, lush and has the consistency of honey -- most definitely the thickest shampoo I've had the pleasure of trying. But what really makes this shampoo so amazing? It makes my hair look, well, amazing. I haven't experienced such shiny, silky strands in forever. It's formulated with tons of good-for-your-hair ingredients: L-Amino acids for repair, Panthenol and Phytantriol for moisture, chamomile, grape seed, rosemary, nettle, burdock and sage for a healthy gleam, silk, wheat and soy proteins for elasticity and strength, and shea butter for bounce and resilience. And frizz? Consider it nonexistent. I don't even need to use a flat iron! And since it's paraben-free, it's even been kind to my tresses after they were color-treated. 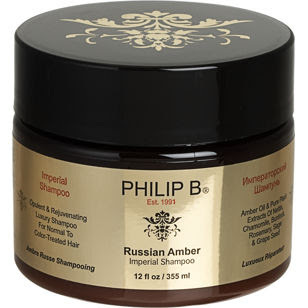 Philip B. Russian Amber Imperial Shampoo is $140 for 12 fl. oz. But what about conditioner? Do you still need it? Do you condition the shampoo's benefits away? OMG, it's amazing, right!? I am mid-post. I was shocked at how silky my hair felt after I used it. Faaaaaaantastic!! Hi Tea -- I do still need conditioner, because my hair is way too thick and coarse otherwise. But no, using conditioner does not get rid of the shampoo's benefits! Hi Katie -- I agree! Seriously one of the best shampoos I've EVER tried.